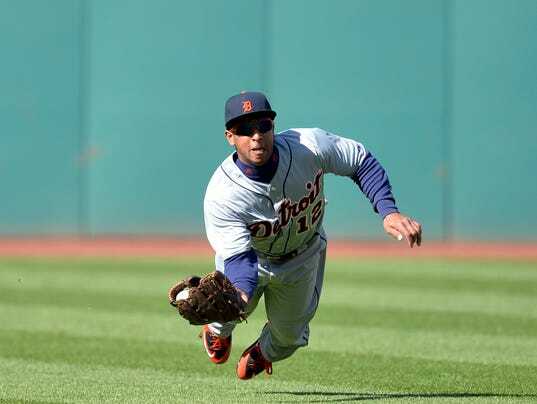 Knowledgeable Detroit Tigers fans who watched the team on a daily basis saw speedy outfielder Anthony Gose covering the vast center field of Comerica Park and considered him an asset to the team defensively. So, they were perplexed by advanced metrics such as Ultimate Zone Rating (UZR) and Defensive Runs Saved (DRS) which suggested that he cost the Tigers 10-12 runs compared to an average center fielder. There was however another statistic which was more in line with the observations of fans. You might have noticed that Gose made 101 Out of Zone plays (OOZ) according to Baseball Information Solutions. This is good for fourth best among major league center fielders. He did not rank nearly as well on the complementary statistic - Revised Zone Rating (RZR). He had an RZR of .906 which means that he made 90.6% of the plays in his zone. That placed him in the bottom third of center fielders. The two measures together suggest that he had very good range, but was not as reliable turning more routine plays into outs. There is a common misconception that RZR and OOZ are connected to either DRS and UZR, but they are not. Whereas DRS and UZR break each position into several zones and treat each sub-zone differently, RZR and OOZ only have one zone for each position. Some fans have asked whether RZR and OOZ can be translated into runs like the more complex defensive measures. A few years ago, Statistics Analyst Colin Wyers (who now does his work for the Houston Astros) developed an algorithm which combined RZR and OOZ and translated these numbers into plays made above average (PMAA) and runs saved above average (RSAA). The average RZR for MLB center fielders in 2015 was about .914. So, Gose's PIZAA = 251 - 277 x .914 = -2. Thus, he made an estimated 2 plays in the zone below what would expect from an average center fielder. The EXPORATIO for center fielders in 2015 was .069. So, Gose's OOZA was 101 - 1,120 x .069 = 24. This means that he made an estimated 24 plays outside the zone above what you would expect from an average center fielder. Gose's PMAA was -2 + 24 =22. So, he made an estimated 22 more plays than would be expected by an average center fielder. For Gose, that comes out to RSAA=19. Thus, he saved the Tigers an estimated 19 runs defensively compared to an average centerfielder. That is a lot better that the -10 and -12 he netted on UZR and DRS respectively. Table 1 below shows the statistics for all MLB center fielders with 900 or more innings in 2015. You can see that Gose ranked fourth in baseball on RSAA. The MLB leader was Royals fly catcher Lorenzo Cain (35) followed by Kevin Pillar of the Blue Jays (34). Is RSAA any better than UZR or DRS or other advanced defensive metrics. Probably not, but it has the advantage of dividing plays into inside the zone and outside the zone, which is information we don't get from other metrics. As always, take these numbers with a grain of salt. It is always preferable to look at multiple metrics and years when dealing with defensive data. In this case, the numbers on Gose are all over the place, so this might be one of those times where you need to make a judgement based on your own observation or the observation of others whose scouting instincts you trust. I haven't seen a lot of scouting info on Anthony in the last year. Any idea what they had to say about his 2015 season? Wow, I'm honored that Yoda reads my blog! I don't think I have any more access to scouts than you do, but I'll see Microline says about Gose's defense. For what it's worth, he gets high scores for his range on the Fan Scouting Report, but not so high for his hands . Seems the young guys with talent like Iggy and Gose are keen to show off on hard plays but lack the consistent fundamentals to turn the routine plays. Call me Suzy, but isn't that the kind of thing a coaching staff is supposed to spot and work on with players? Where Did James McCann Rank Defensively in 2015?